From Nuremberg mainstations the distance to the centre of the city is only about 7 minutes. Trains from the Deutsche Bahn run daily regulary to Nuremberg mainstation. Take the highway A3 towards Würzburg/Nürnberg-Nord and use the exit 85 to Nürnberg-Nord. From there thread in the B2 towards Nuremberg airport. Afterwards simply follow the instructions to the city hall/centre of Nuremberg. Nuremberg Airport is the nearest airport to the centre of the city. The distance from the airport is only about 17 minutes by car. Flights reach Nuremberg Airport on a regular basis. Wonderful city in Bavaria, which is the second-largest in Bavaria and secretly the inofficial capital of Franconia. This city has a lot to offer and draws visitors all year round! The wonderful city offers many attractions no wonder that for many years the city of Nuremberg was the undeclared capital of the Holy Roman Empire. Even German Kings loved the area and kept their crown jewels there. Nuremberg is rich on architectural wonders such as beautiful historical buildings from different centuries. Unfortunately almost 90 percent got destroyed during World War II. Luckily today most important buildings of the city, including the castle and churches in the Altstadt (old inner city) have been restored and returned the city to it´s former glory. After the Second World War Nuremberg was chosen as the site of the Nuremberg Trials - the war crimes tribunal in 1945. As the second largest city Nuremberg has a rich museum landscape, from the house of the world famous Nuremberg Albrecht Dürer genius (who was actually born here) to modern art in new museum. Visitors will find everything here that gladdens the heart of art and culture enthusiasts. In addition Nuremberg offers a variety of attractions like the opera and theatre or many options for indoor and outdoor sport activities. Major sights of the city are within the Altstadt and reachable by foot. Tip Visit the most famous christmas market of Germany, the Nuremberger Christmas market 'Christkindlesmarkt'. The Christmas market is wonderfull with wooden stalls with christmas gifts and souvenirs to buy, christmas music, local specialities like Nuremberger sausages and offers a wonderful christmas atmosphere in the centre of the city. Very recommended and an unforgettable experience for everyone. The city Nuremberg presents one of the biggest and most beautiful Christmas markets in Germany,called 'Christkindlesmarkt Nürnberg'. The market takes place in the Old town of Nuremberg and offers many wooden stalls with local specialities,christmas gifts and souvenirs.Wonderful atmosphere guaranteed. In the entire city Nuremberg visitors have the opportunity to try local specialities, such as Nuremberg sausages, called 'Nürnberger Würstchen'. Very delicious sausages and typical for the city in Bavaria, very delectable with bread and dressing. Special attraction in the area and definitely worth trying. Through the city the river 'Pegnitz' is crossed, which is surrounded by parks and nature. Around the river visitors have the wonderful opportunity to enjoy the view and to explore nature. Very relaxing and recovering times are guaranteed in the fresh air for adults and children. Fascinating views from everywhere over the city. Also this Leonardo hotel has a roof terrace, a sauna, and a generous breakfast buffet. It’s a 3 star hotel in the city center with the tram and underground stations only 250 meters away. The rooms are spacious, on-site parking is available and the reception is open 24 hrs. The old town is only 500 meters distant and the Nürnberger Messe is approximately 15 minutes away. 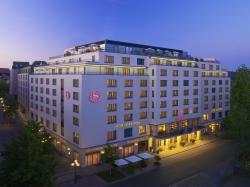 This elegant hotel is set on the edge of Nuremberg’s Old Town, a 3-minute walk from Nuremberg Train Station. It features a top-floor spa with roof terrace and a gourmet restaurant. Situated opposite Nuremberg's Neues Museum, this 4-star design and theme hotel is a 3-minute walk from the Lorenzkirche church and a 5-minute walk from the central railway station.